Now that Empire Magazine has already unveiled both fold-out covers for its Star Wars-themed issue – depicting both sides of the Force, no less – the outlet has today unleashed the first photo (which you can see above, along with the covers) of what is sure to be a steady stream of new information for J.J. Abrams’ galactic adventure, Star Wars: The Force Awakens. On this occasion, it’s the Dark Side of the Force that Empire has spotlighted, ushering in Adam Driver’s nefarious Kylo Ren into the limelight for a truly striking shot. 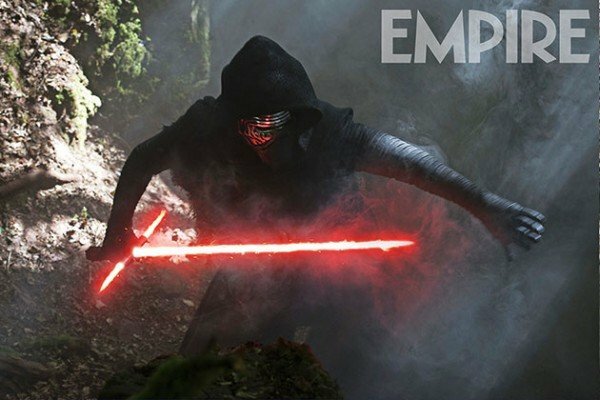 Brandishing his by-now infamous cross-guard lightsaber, The Force Awakens‘ lead baddie is certainly ready for battle. Described as one of the leading members of The First Order and a member of the enigmatic, cult-like group known as the Knights of Ren, Driver’s character is riddled with mystery. Despite the fact that there’s still an awful lot we don’t know about the film’s antagonist – will he ever take off the mask? – Kylo Ren is shaping up to be a force to be reckoned with. He’s the most interesting character to enter the Star Wars fray in generations, according to series stalwart Lawrence Kasdan, who stated that “there’s never been a character quite like the one that Adam plays.” Very intriguing indeed. What we do know is that Ren is merely a title that Driver’s villain has inherited, and that he’s obsessed with all things Darth Vader, worshipping the fallen harbinger of death as though he was a God. How exactly this will filter into the plot remains to be seen, but it’s an interesting set-up considering that The New Order is essentially formed from the ashes of the Empire. Driver will be joined by Gwendoline Christie as Captain Phasma, Domhnall Gleeson as General Hux, John Boyega, Daisy Ridley and Oscar Isaac, not to mention Mark Hamill, Carrie Fisher, Harrison Ford, Peter Mahyew, Andy Serkis, Lupita Nyong’o, Anthony Daniels, Kenny Baker, and Max von Sydow. Star Wars: The Force Awakens will whisk fans back to a galaxy far, far away when J.J. Abrams’ sequel hits theatres on December 18.